← WordTracker is a wonderful keyword research tool that: tells you what people are searching for gives you tons of suggestions for keyword phrases computes how much competition you might face for you selected terms. If you want more traffic to your site or just want to better understand what your market is looking for you should explore WordTracker. Duct Tape Marketing FREE NEWSLETTER: By visiting Wordtrackers website you can sign up for their FREE newsletter and join the 90,000+ people who get free search marketing advice and knowledge as soon as it’s published. 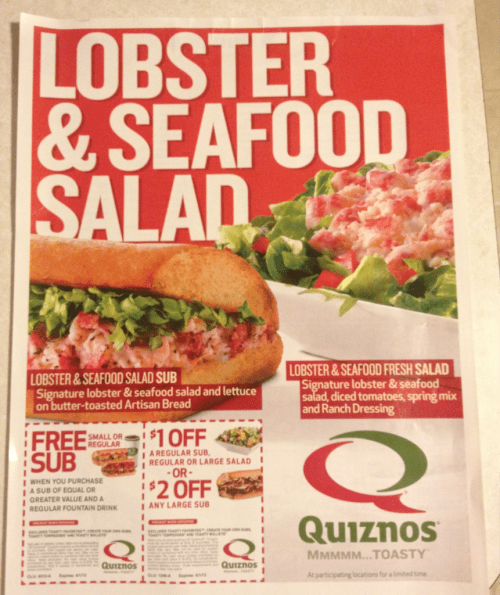 Quiznos Lobster & Seafood Salad Sub -is this something you would buy or want from a quick serve restaurant like Quiznos? To me this is another example of a company releasing a product that should of never been released. Before you release a new product , you need to make sure a lot of thought and reasoning can back up your actions. Put yourself in the consumers shoes, think does this product appeal to your company’s typical customer. Quiznos is not a restaurant I would associate with seafood and never will be. Why would anyone want seafood on their submarine sandwich? This new product release would make more sense to be released at a more strategic geographic region like maybe Maine where their is more of a desire for seafood and it can allow for a higher quality of seafood to be put into Quiznos new Lobster & Seafood Salad Sub. So how bout it, are you ready to have seafood on your submarine sandwich? Or does this just seem a little too fishy to you? This entry was tagged Lobster & Seafood Salad, print media, product launch, Promotions, Quiznos, submarine sandwitch. Bookmark the permalink.